MSV: Beth Mason operative on efforts to save HUMC "They can really destroy the administration if they work things properly"
Beth Mason operative on efforts to save HUMC "They can really destroy the administration if they work things properly"
The following like MSV's exclusive February 17th story is compiled based on investigative reporting/analysis/opinion spanning years of MSV's coverage in Hoboken and attending hospital board meetings at HUMC. Emails contained here are part of the public record obtained in over two and a half years of civl litigation in the well known lawsuit against this MSV editor and a dozen or more Hoboken residents. The documents numbering in the area of 100,000 including electronic data are available to the public at Hudson Superior Court in the case: Bajardi v Pincus. The shadowy world of Councilwoman Beth Mason's numerous political operatives operating in Hoboken is highlighted in the attached email exchanges of their efforts to undo and stop the eventual successful sale of Hoboken University Medical Center in late 2011. Back in early 2011, many in Hoboken watched helplessly as Hoboken University Medical Center hemorrhaged losses in the millions and then tens of millions. Mayor Dawn Zimmer who took office in mid 2009 was herself unsure what was possible to save the more than 100 year old institution founded in 1863. The City of Hoboken had backed the hospital with $52 million in bonds back in 2007 in an attempt to stave off closure of the formerly named St. Mary's. Any hospital closure inclusive of winding down liabilities was thought to add possibly $20 million or more and lead to the City of Hoboken's bankruptcy and trigger municipal and public safety layoffs. Many observers thought any effort to save HUMC doomed. Lane Bajardi in one of his innumerable ghostwritten Hoboken411 stories in early 2010 wrote, "Will the hospital close?" Pointing to mistaken information from the State of NJ officials saying HUMC would close "in the next few months" he gloated about Hoboken411's coverage, - his, calling it the "only source for in depth coverage of the "Cons" of taking over the hospital," in line with the previously held party line position taken by Beth Mason. In late September 2011, Hoboken411 with a suspect Star Ledger story would announce the hospital's death with a gleeful morbid D.O.A. graphic. In the end, it would be another failed political operation as Hoboken411 and Lane Bajardi would be forced to eat their words. Beth Mason with her "business partner" James Barracato. When asked about him at the Bajardi trial she limited her answer to those two words. 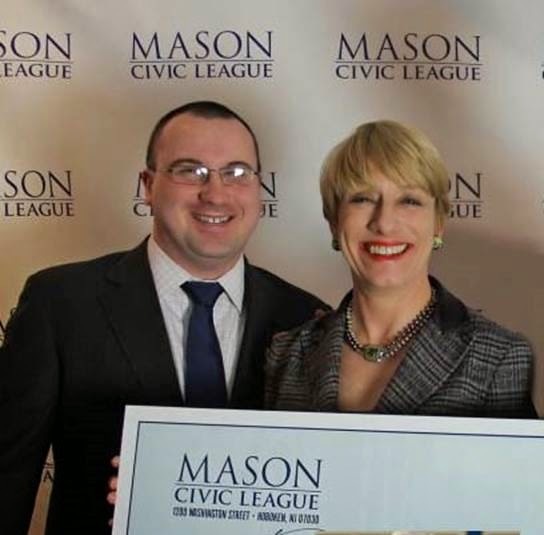 He also sits on the board with her and her husband on the questionable 501(c)3 the Mason Civic League. Mason's financial disclosure forms show her an owner of Cooper Place LLC. A dive bar with the same name in Weehawken is thought run by Barracato and his family. Over months culminating with one last attempted act of sabotage in October 2011, Lane Bajardi along with other self-pronounced "Masonistas," a dwindling band of mostly paid adherents to a cult of Beth Mason would do their best to see undone the successful bidder HoldCo announced at a hospital board meeting in early 2011. The transaction's complexity was enormous and the institution in a state financial experts saw as unlikely to lead to a purchase by anyone. As part of Beth Mason's sabotage effort, Exhibit A, a series of March 4, 2011 emails between Councilwoman Beth Mason, political operatives James Barracato, Adam Alonso, Lane Bajardi and Beth Mason's husband Richard G. Mason, a bankruptcy attorney at Wachtell, Lipton Rosen & Katz. Talking Ed Note: More to come on the organized Beth Mason sabotage to sink the HUMC sale and "destroy the administration" of Mayor Dawn Zimmer. This story is dedicated to the memory of Steve Rofsky, a Hoboken resident who was instrumental as part of a volunteer Hoboken hospital board in saving Hoboken University Medical Center. Related: The original MSV story, "City: HoldCo has not pulled out of deal," Hoboken411 claim completely bogus.